Yesterday I was honored to be invited to join the opening plenary panel at the Minnesota Writers and English conference. The panel was on the theme of Locations of Literacy, and the other panelists discussed Cultural Literacy, Civic Literacy, and Environmental Literacy. I, of course, talked about Information Literacy. Here is a close approximation of the talk I gave. I drew the slides in the iPad app Paper by 53. Before I get started, I just have to say that back when I was a writing center tutor myself, I never anticipated a time when I would address a room full of Writing and English folks, let alone speak on a topic as seemingly dry and boring as information literacy. And if you’d told me then that my favorite classes to teach would be on the epistemological and rhetorical underpinnings of citation styles… well, let’s just say that would have seemed too ridiculous to even warrant a laugh. But here I am; life is weird. Anyway, do you remember that meme that was going around a couple of years ago? 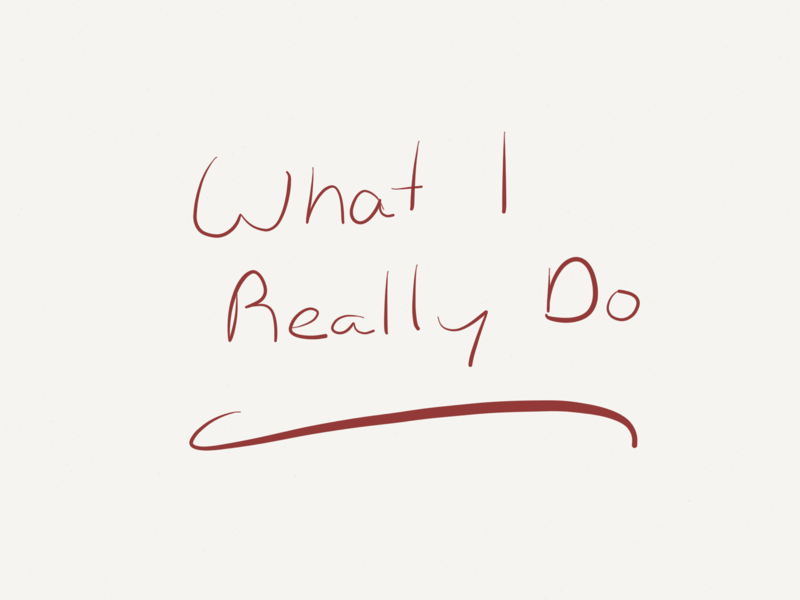 “What my mom thinks I do… what my kids think I do… what I think I do… I what I really do?” Here is one that resonated for me. Who hasn’t wanted to be that teacher from Good Will Hunting? 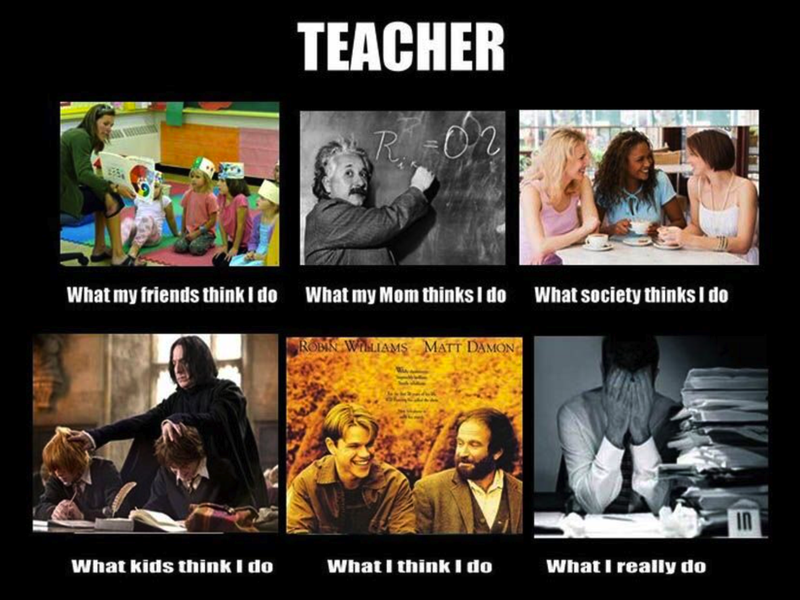 And of course we all spend a lot of time looking like the poor teacher in that last panel. 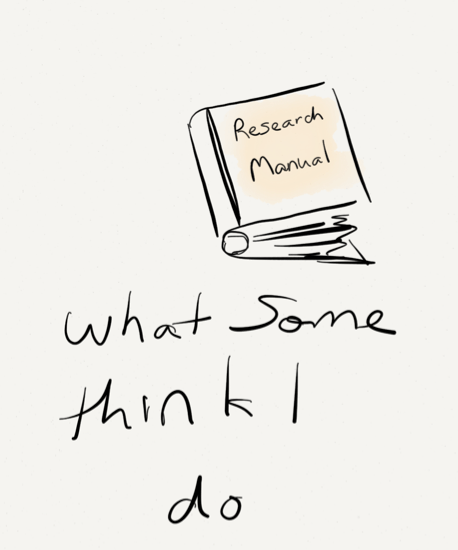 As an instruction librarian, here’s what lots of people think I do, even other librarians: walk students through the Manual of Research Procedures. “Could you work this phrase or that module into all your instruction sessions?” Or “What do you tell all your students about how this or that back-end system works?” In this manual, if you turn to page 43 you’ll find Boolean operators, page 65 is Interlibrary Loan Policies and Procedures, and page 682 is on JSTOR options and techniques. If this really were my job I would be so bored, and a bored teacher is a bad teacher, so I’m really glad that this is not my job. Another thing I get a lot is this is people thinking that we’re in the business of handing out answers. We’re all about teaching students to fish — helping them come up with strategies to use and resources to explore. So what is this “information literacy” thing that I’m teaching and advocating for? Well, first, it’s something that we’re all in the business of teaching – it’s just that I make it my focus. 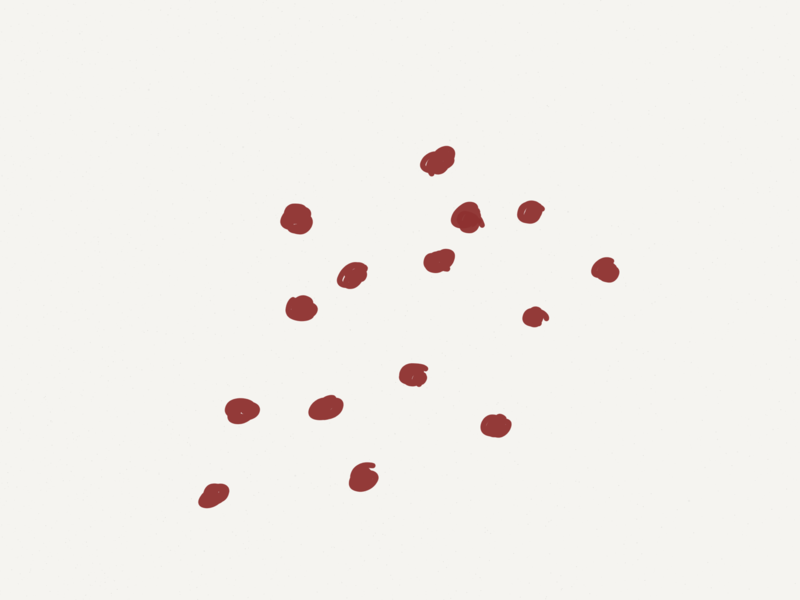 And it is located in the spaces between information. 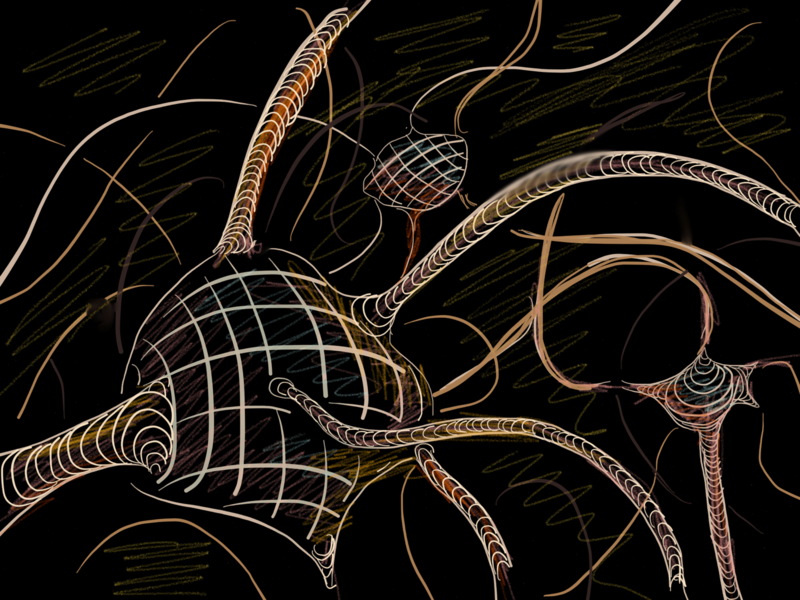 Think of a neural network. The neuron itself is fascinating, and I’m sure there’s someone somewhere out there who is making a single neuron his life’s work. But this wonderful neuron is nothing without its connections to other neurons in the context of a nervous system. It can fire and fire to its heart’s content, but if it’s the only neuron firing in this system, or if none of the other neurons are cooperating with each other, you’ve still got a dead body. No, it’s the cooperative, dynamic negotiation of signal and noise, impulse and understanding that animates the body. Just so, it is the discursive interplay between the information itself, the community’s values and practices, and effective participation in context-appropriate conversation — THAT is where information literacy sparks to life. Here’s another way to think of it. Too often we concentrate on the books, articles, images, and other items — the stuff of research. Gather that stuff, cite it properly, don’t plagiarize, and you’ve got a research project! We have all seen those papers. “Here’s everything I know about x.” Or “here are a bunch of good sounding quotes that I like in this particular order.” But seeing research that way is not information literacy. The student may have arrived at these communicational non-entities using perfectly constructed, Boolean-laced search strings in exactly the right databases. The student may have evaluated that information beautifully and chosen exactly the right articles and books to cite perfectly in these papers. But this is not information literacy — neither you nor I am happy with this outcome (a point that Barbara Fister, whom many of you may know, made decades before I thought I arrived at it on my own, by the way, in her article “Teaching the Rhetorical Dimensions of Research.”) These techniques for finding and evaluating are the grammar, spelling, and punctuation of my profession: very important, for sure, but not sufficient. No, information literacy is about negotiating understanding within a context. 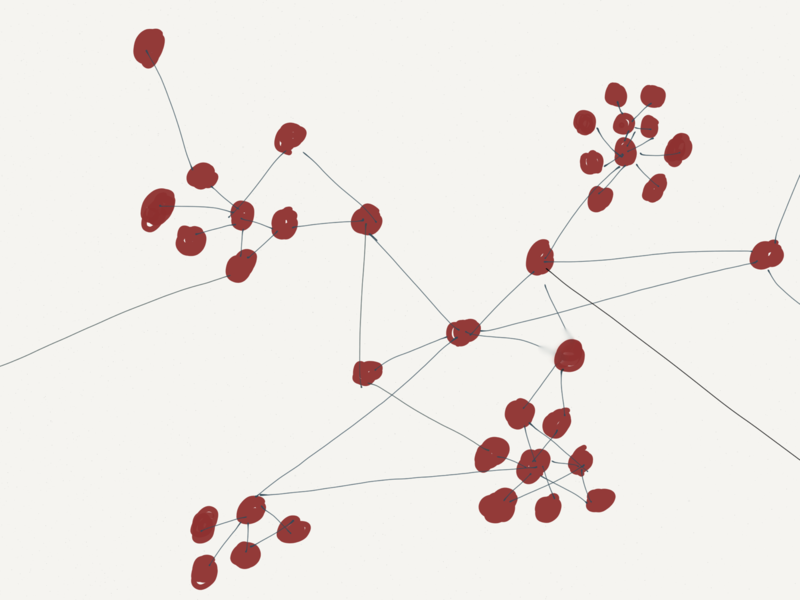 It means being able to map out the community of inquiry and the various conversations that community is having. And then, it means being able to show that community where new knowledge fits. Parroting back other people’s conversations is not an effective conversation tactic in real life, right, so why should it work here? This is where you get to expand the conversation in very real terms. 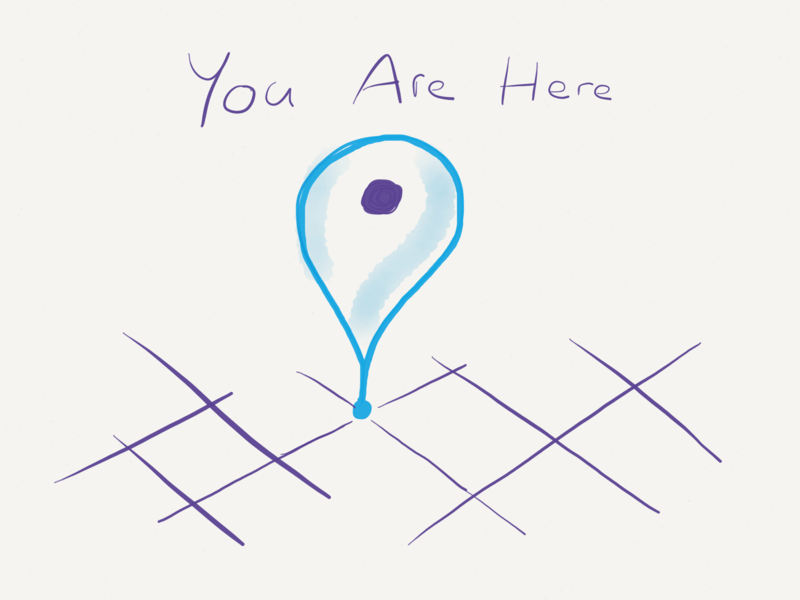 But even this mapping is not yet enough. It helps us see the social and relational aspect of information literacy, but it doesn’t highlight the very real importance of the local culture of these conversations. 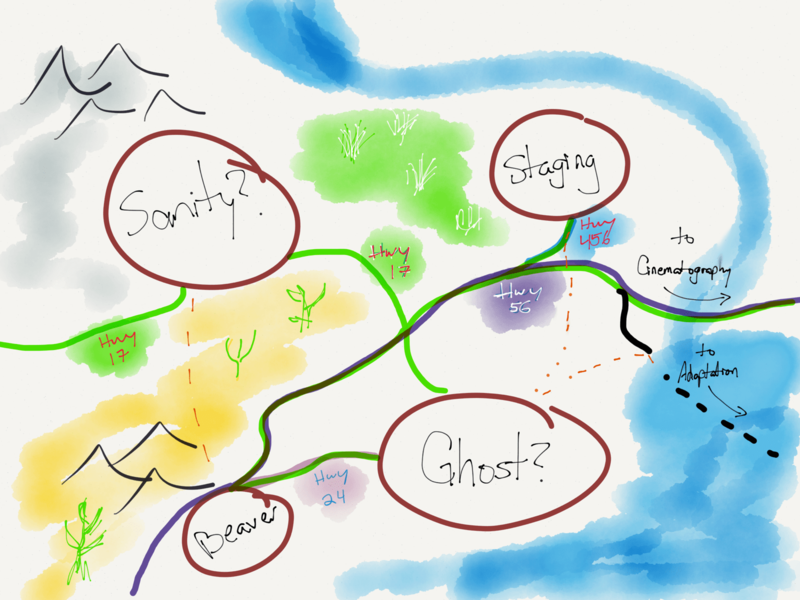 Here is a small section of the Continent Of Hamlet Studies. As Annemarie Lloyd says in her wonderful book, Information Literacy Landscapes, that information literacy is “the product of negotiated construction between individuals” (12). She says these individuals are “interacting with the artifacts, texts, symbols, actions and in consort with the other people in [given] context” (12). She calls this a “socially discursive practice” (15). You see why I think writing and information literacy go so well together? So where is this literacy located? It is inextricably intertwined with communication. It is, as Rolf Norgaard says in his article “Writing Information Literacy,” “an inventional resource for the writing student, not merely a resources for supporting what has already been invented” (129). And it exists in the vital and dynamic connections between information and people. So let’s all encourage our students to take the Red Pill. It’s a whole lot more fun. Fister, Barbara. “Teaching the Rhetorical Dimensions of Research.” Research Strategies 11, no. 4 (1993): 211–19. Lloyd, Annemaree. 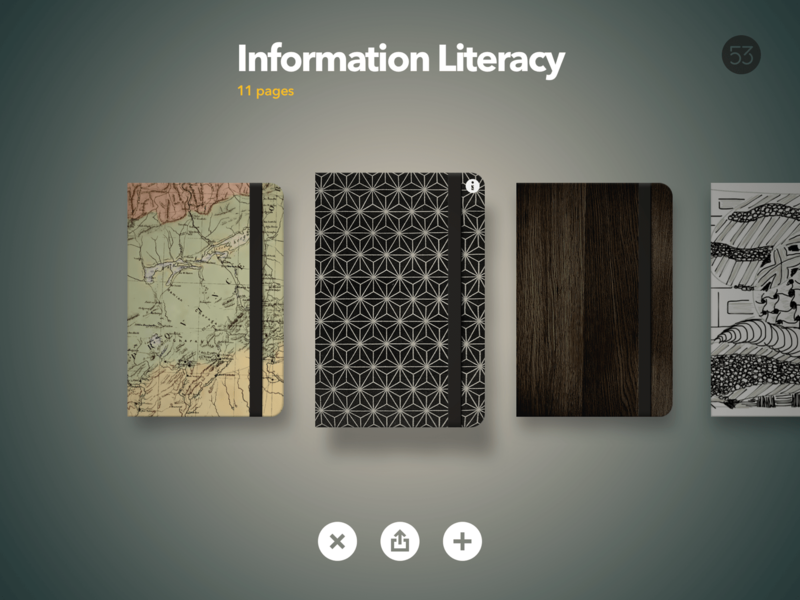 Information Literacy Landscapes: Information Literacy in Education, Workplace, and Everyday Contexts. Oxford: Chandos Publishing, 2010. Norgaard, Rolf. “Writing Information Literacy: Contributions to a Concept.” Reference and User Services Quarterly 43, no. 2 (2003): 124–30. I think more and richer face time with students, or more and richer tutorials, or however that works on your particular campus is always important. 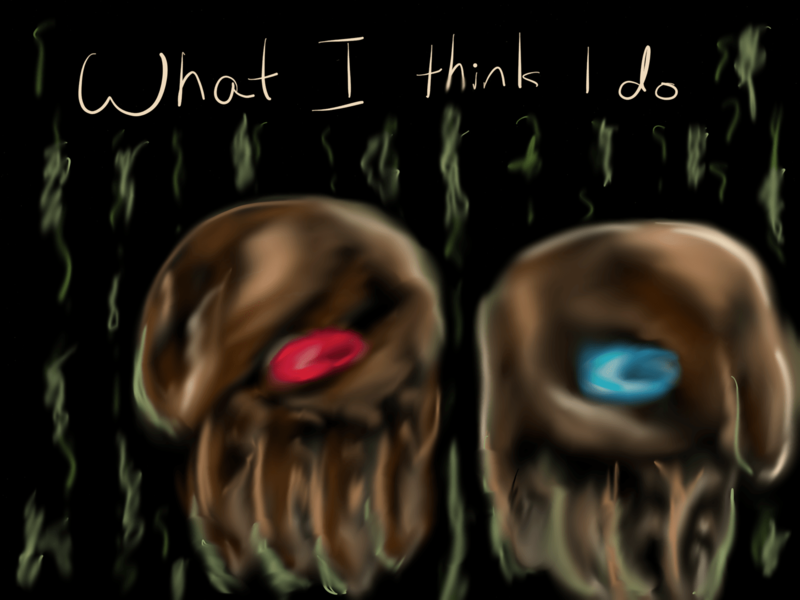 But there are lots of ways to highlight these things in a typical one-shot as well. Things like saying “computers can’t read” and then talking about the different vocabularies of different disciplines combines extremely practical search advice with these broader concepts. Or saying “The bibliography on this article is more than an alphabetical list — it’s also a map to the topic” is a great way to talk about the hows and whys of following up on citations. Essentially, what I try to do in my sessions is present the practical as it really is — as something that serves a larger goal. And I pick the larger goals based on my knowledge of the assignment’s learning goals or, when that’s not possible, based on my own higher order learning goals for students at that level of the curriculum.